Is your upholstery looking tired & grubby? Why Choose Our sofa cleaning service? Fabrics require a much more delicate approach to cleaning than carpets. Finding professional sofa cleaning in Telford, Shrewsbury & Shropshire can be hard over the internet. This is because upholstery cleaning requires different tools, equipment and products than what might be used on carpets. There are also many hidden dangers if cleaning is not undertaken properly and having the right knowledge is vital. We undertake a full survey of each suite we quote for. We do this to check any issues which may arise from wet cleaning the fabric and to check for any hidden problems. All our cleaning methods use the latest products for superior cleaning. The products and systems we use also leave no chemical residues behind. We merely leave your fabrics clean and fresh. Some fabrics require “dry cleaning” Don’t worry if you fall into this bracket. Whilst more complex than a standard clean, we have the right products to be able to carry out this specialist service. All your upholstery will receive a 7 point extensive clean. This leaves your fabrics looking clean and smelling fresh. Using the latest types of rapid dry wet cleaning equipment means your upholstery won’t be left wet when finished. Fabrics are normally touch dry within 1 to 3 hours dependent on the type of fabric being cleaned. Don’t forget we also do Leather cleaning. Cleaned two badly soiled armchairs. Professionally accomplished and made to look like new. No mess and reasonable price charged. Will be using them again next year. Excellent, professional service carried out by very polite, friendly people. Even a stubborn stain on the sofa is now hardly noticeable due to the care and attention it received. Today Jared came and cleaned our carpets and upholstery and he did an amazing job and was very professional . I would highly recommend J.L.Carpet Cleaning as I can guarantee you will not be disappointed. A very satisfactory job completed by very professional and experienced people. Would recommend them to my friends,etc without any hesitation. Pleased with the results of their work and their friendly approach to our problems. Faultless service! From the initial phone call to Jared’s departure everything was just perfect. Jared and Jenny cleaned my mums suite this morning. They arrived on time and set to work straight away. Their work was faultless and the suite looked like new. We will definitely use them again and sing their praises to all that will listen. Fabulous job done by lovely friendly people. Efficient and friendly the chairs that they cleaned came as good as new and we will certainly use JLCarpet Cleaning again for our carpets also. Jared and Jenny cleaned our suite for us this morning. They arrived spot on time and we immediately felt at ease with them. They worked so hard even though we were in the middle of a heatwave. Their work was faultless and we felt comfortable with them in our home and confident in their work. We were especially impressed because the products they use are all natural products. We will definitely call them when we need work doing in the future. A job well done,very proffesional. Jared cleaned our sofa and chairs - we are very pleased with the result and would not hesitate to recommend his services. 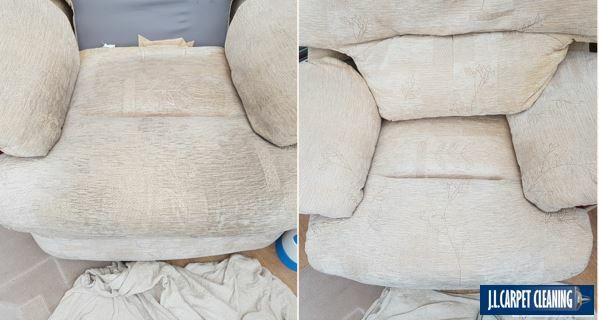 A polite, efficient and effective cleaning service done on our sofas that we bought as in 'perfect condition' on e bay but came with many stubborn marks and a particularly difficult crushed velvet fabric to clean. The choice of methods to clean these were restricted to a dry cleaning fluid and a lot of manual work involved in brushing up the pile and removing the dirt. The results are excellent. We are very pleased with the service provided and would use again. Thank you for your hard work and achieving such pleasing results. Exceptionally happy with the cleaning of our stairs and the rescuing of our beloved new ottoman which we’d carelessly thought we’d destroyed with a tough stain. Couldn’t be happier. Very polite and helpful service. The carpets and upholstery came up a treat. Thank you. When Jared first came to my house after my enquiry, to first check the material on the suite, he was very professional and polite and gave immediate confidence that he would take care of your home. On the day agreed to clean the carpets and clean the upholstery (3 piece suite); Jared arrived on time, put protective blankets in the hallway (and on his feet), carried on with the work after a quick brief on how to proceed (either carpet first or suite) and just got on with the job as his first attendance had suggested with professionalism and care. The equipment Jared uses are just perfect for the work at hand (look expensive and purposeful) Jared was thorough and did not stop for the best part of the day and only when he was offered a drink did he accept a cold drink (he needed it). When he had finished he explained what he had done and after inviting me to inspect his work, it was clear he was proud of his work (another good sign if more was needed). He left, cleaning up behind him and I was glad I choose this person/company to clean my carpets and upholstery. Thank you Jared, great job and I wish you continued success. David. Prompt and efficient service. Professional/knowledgeable advice also given for upkeep and ongoing care. This was our first time to have settee and chairs cleaned and we are well pleased with the result. We would certainly recommend this cleaning service and will be using them in future. The service I received was exceptional, right from the start. Very polite and professional all the way through. Excellent service.